You are here: Home / Streets for People / Streets for People 2016- A Big Success! Streets for People 2016- A Big Success! The fifth annual Streets for People in downtown Fairfax on Sunday, August 28th was an explosion of community spirit! 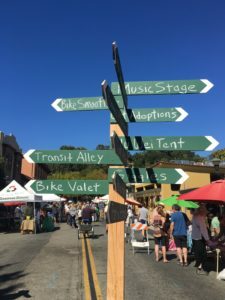 Approximately 1,500 people enjoyed the unique Fairfax vibe in the open street on Bolinas Road. The street was alive with music, dancing, hula hooping, art and crafts, games, local food and other offerings from residents and Fairfax businesses. To name just a few: the upcoming Mas Masa served up delicious quesadillas, the Gestalt Haus offered free hot dogs to the kids, Mana Bowls gave out samples of their Acai bowls and 7-11 gave out free slurpies to participants. Bolinas Road newcomer The Find created a Makers Meetup inspiring crafts on the street, The Forge offered free temporary tattoos, Tatyana’s Magic Brush did face painting, and Joseph Jacques of Harmonic Humanity provided a lovely musical backdrop with his street piano. The Youth Music showcase, organized by Jack Irving, featured ultra-talented youth musicians and the Clothing Swap was a huge success, once again. 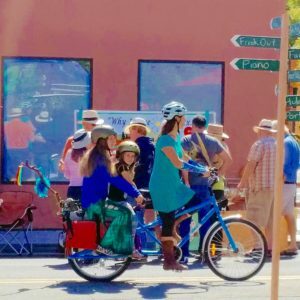 Other highlights: Families on cargo bikes and a new generation of riders participated in Kidical Mass, and paraded through the street on their decorated bikes. Naby Bangoura and his class at Roco Dance set the beat for the event with vibrant African drumming and dancing. Brycken Olive of Sol Studios brought soulful energy to the street with her Roots Dance class. New this year was the lively “Teen Scene” in Bolinas Park and featured an open mic, yoga, community art, henna tattoos, hula hooping and games. a bicycle-powered smoothie blender sponsored by Marin Safe Routes to School, a big hit! Thanks to Fairfax Market for the fruit donation! The Marin IJ captured the spirit of the event beautifully in this article. Check out the event website to learn about the vision of this open streets event and the international open streets movement. Streets for People was inspired by Ciclovia in Bogata. Columbia. HELP KEEP THE WHEELS TURNING! 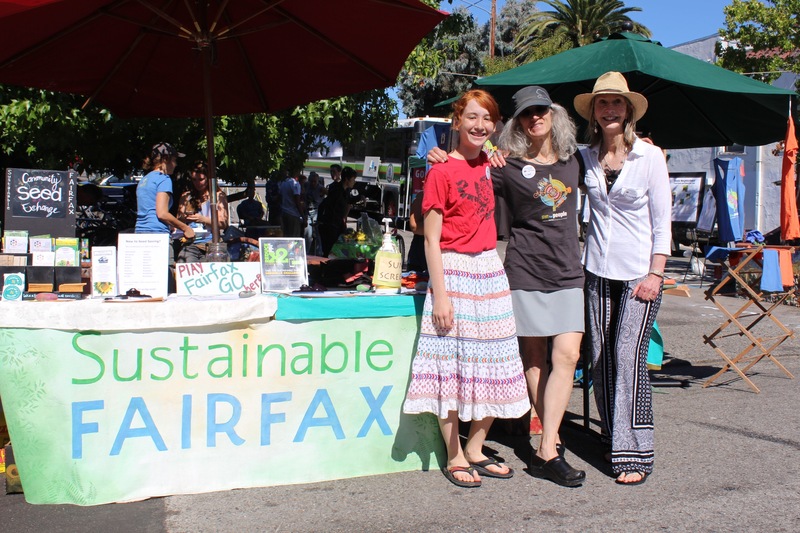 Sustainable Fairfax takes the lead on the organization of Streets for People with sponsorship from the Fairfax Chamber. The entire event is run on a budget of about $1,000, and the organizers/volunteers donate their time as a heartfelt gift to their sweet community. Please consider providing support at the $30, $60 or $100 level here. Or buy an organic Streets for People t-shirt or tank, generously sponsored this year by Good Earth Natural Foods. Thanks to all of the VOLUNTEERS who made this event run like a charm! SPECIAL THANKS: Thank you to Good Earth Natural Foods for sponsoring the Streets for People Shirts (order here), Patty at For Paws for providing us with event storage, Polly at Fairfax Variety for donating paint for street art, US Pure Water for the Water Station, and Fairfax Market for donating the fruit for the Bike Powered Smoothies!